The Giants shut out the Dbacks thanks to the beast Matt Cain. Matt Cain just locked up his starting role in the divisional series championship Game 1 with an outstanding performance today getting his 16th win going 7 innings allowing just 4 hits, 1 walk and 6 K’s. The Dbacks struggled at the plate tonight and could not really get the ball rolling as they go 1 for 10 with runners in scoring position and strand 9. The Giants gave them plenty of opportunity with 3 errors but the Dbacks just couldn’t string any hits together to get a run across. Wade Miley the rookie of the year candidate would go just 4 innings and give up 3 earned runs on 6 hits with 3 walks and 3 K’s and drop to 16-11 on the season. Matt Cain would not only beat the Dbacks with his arm but would also do it with his bat in the 3rd inning hit a single to centerfield that did not look like a pitchers swing. Angel Pagan would walk followed by a sac bunt by Marco Scutaro. 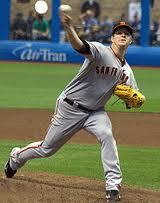 Pablo Sandoval would hit a RBI single to score Matt Cain the only run that would be needed today to beat the Dbacks. Buster Posey Collects RBI 100 On A Base Hit. 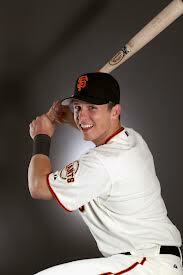 Buster Posey would hit a single in the next at bat to get his 100th RBI on the season and take a 2-0 lead in the game. In the 4th the Giants would get a triple out of Brandon Belt who went 3 for 4 on the night to lead the way for the Orange & Black. Marco Scutaro would get a RBI single to LF to score Brandon Belt and the Giants end the night beating the Dbacks by a score of 6-0. My game ball has to go to the lights out pitching of Matt Cain who got the win tonight with his arm and 2 for 2 performance in the batters box. 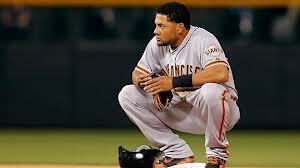 Notes: The Giants are expected to release a statement tomorrow that will end the season of Melky Cabrera as they decide to not bring him back this season in the playoffs after testing positive for performance enhancing drugs. 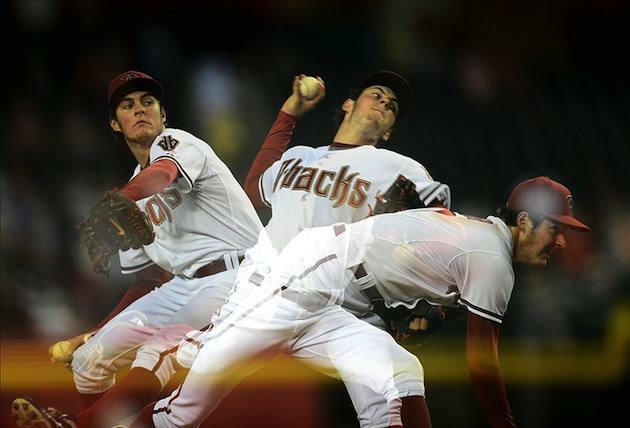 Preview: The series is even at one a piece and will be decided tomorrow night when the Dbacks send young gunner Patrick Corbin to the mound to Square off against Barry Zito. Nick Crawford joined BHP Baseball in the 2012 baseball season as the websites beat writer for the Arizona Diamondbacks. I am a baseball and softball player that plays over 200 games a year traveling all over to play in tournaments on the weekends. I have coached baseball for over 10 years at various levels including my son’s team. My passion for this game we all love is unmatched. I am a huge Florida sports fan across the board Marlins Dolphins Heat are my favorite teams. I am also a huge Arizona Diamondbacks fan & since Nevada doesn’t have a pro team I follow the AAA Reno Aces, the Diamondbacks farm system. 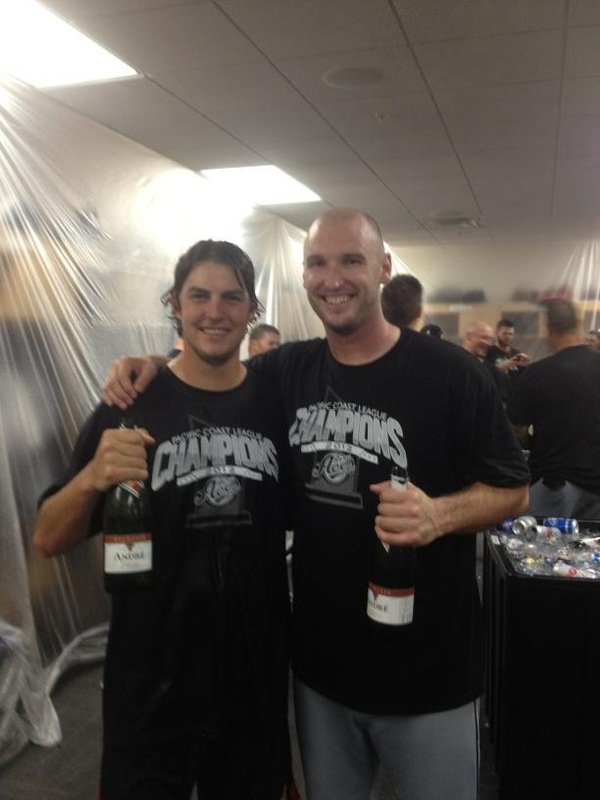 If you ever want to talk Diamondbacks, or Marlins you can find Nick on Twitter @DonkeyPuncher74. The Diamondbacks head into San Francisco to face the Playoff bound Giants in hopes to steal a few wins and gain a few games towards that hopeful wildcard spot. The Dbacks who scratched Rookie Tyler Skaggs from his start due to a loss in velocity in recent starts has been shutdown by the Dbacks so they turn to Josh Collmenter. The Giants send Tim Lincecum to the mound to square off against a Dbacks team who has absolutely dominated him this year and had a loosing season so far this year. This outing for Lincecum would be reminiscent of his last against the Dbacks as he gets shelled by the man we will now refer to as “The Lincecum Killer” or TLK Paul Goldschmidtwho was 7 for 14 with 4 home runs batting .571 & 10 RBI’s before today is now 8 for 15 with 5 home runs. Today was not a story about how Lincecum dominated hitters but how he got dominated by the Dbacks and Goldschmidt who went 1 for 2 with 5 RBI’s with a run scored. Tim Lincecum would start off the night with 4 straight balls to Adam Eaton for a walk, Aaron Hill would single on a line drive to LF followed by a Justin Upton ground ball that goes off of Lincecum’s shoulder for an infield base hit to load the bases. With 1 out Paul Goldschmidt would hit a sacrafice fly to LF to score Eaton and Lincecum who could not command his fast ball would throw a wild pitch and Aaron Hill would score before a walk to Jason Kubel before getting Ryan Wheeler out. 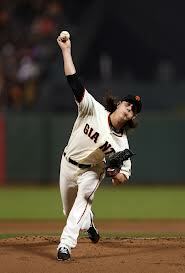 The 2nd inning would go by without a score but in the 3rd inning Lincecum would struggle again. Aaron Hill would lead off the 2nd with a single followed by a passed ball that would move Hill up 90′. Miguel Montero would walk and then Paul Golschmidt would step to the plate. The Lincecum Killer would take a breaking ball that missed high and drive it deep down the line and bounce it off the foul pole for his 5th home run against Lincecum and collect another 2 RBI’s to make it a 5-0 ball game. Into the bottom of the 4th and Josh Collmenter gives up a lead off double to Marco Scutaro to continue a 13 game hitting streak and Buster Poseywould swap places with him on a RBI double of his own as the crowd chanted MVP MVP. Buster Posey is in a tight race for MVP with Pirates Andrew McCutchen, McCutchen who may have the lead right now because of the slugging numbers is barely holding on to a lead in numbers but Posey is Gaining on him. In the 5th Lincecum would serve up a single to Aaron Hill and a Justin Upton Walk would be yanked off the mound by Bruce Bochy after 4 innings and 7 runs on 5 hits and be replaced by Dan Runzler. Runzler like Lincecum would struggle to find the strike zone and would walk his first batter before falling victim to The Lincecum Killer Paul Goldschmidt who would hit a sac fly to center to score Aaron Hill to give the Dbacks a 6-1 lead. Things would seam to get worse when 1 batter later while Jason Kubel was batting another wild pitch would be thrown and would cost the Giants another run. The Dbacks pitching would record 10 straight groundouts in the next 3 innings while Aaron Hill recorded 4 straight outs at 2nd. The Giants would add a run on the board on a single by Xavier Nady single and a pinch hit double by Ryan Theriot to score a run in the 8th. The run in the 8th would be their last scoring opportunity and the Giants fall short on a night where Paul Goldschmidt could do no wrong. 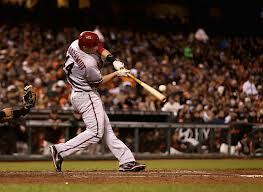 My Game Ball goes to The Lincecum Killer Paul Goldschmidt for hit Home Run and 5 RBI’s. The Honorable mention goes to Aaron Hill who went 3 for 5 scoring 3 times. 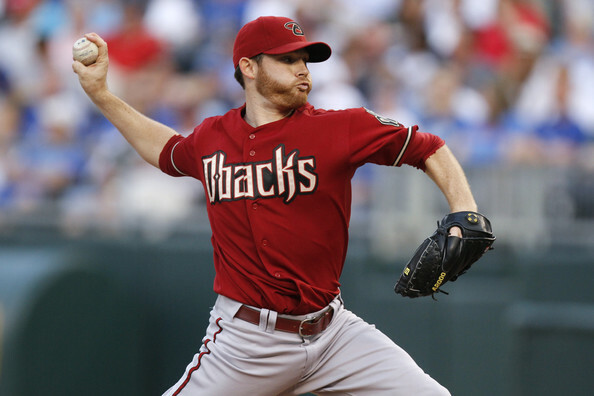 Preview: The Dbacks look to Rookie of the year candidate Wade Miley who is 16-10 with a 3.25 ERA against the Giants Ace Matt Cain who is a staggering 15-5 with a 2.86 ERA. The Dbacks who have won 7 out of 9 games recently has scored 5 or more runs in 6 of the last 7 games will have a tuff task trying to hit one of the most dominant pitchers in MLB today. The Dbacks pack their bags and head to Colorado to face the last place rockies in a 4 game series at Coors Field. The Dbacks mathematically can still make the second wild card slot in the playoffs with a little help from some loss by other divisional teams. All the Dbacks can do is take care of their own buisness and keep winning to give them a chance and the rest will work itself out. The Dbacks would throw some haymakers in this game swinging for the fences and would jump out to a lead on a Justin Upton walk followed by a Paul Goldschmidt RBI double to get the lead 1-0. The Rockies would answer with a single by Dexter Fowler and a double by Josh Rutledge to make it 1-1. 2 batters later Wilin Rosario hits an RBI single to left field to score Rutledge. The Dbacks would strand the bases loaded in the 2nd with a single and 2 walks. In the 3rd the Dbacks would get a walk from Justin Upton and he would steal 2nd base so the Rockies walk Paul Goldschmidt. 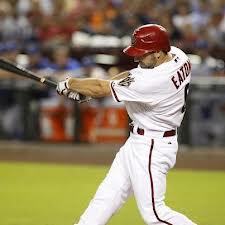 Elmore would hit a sac RBI in the 9th to cap a 19 hit night for the Dbacks and a blow out 15-5 score. 7 Dbacks players record 2+ hits in this game as they score in every inning but the 2nd. Todays Game Ball goes to Miguel Montero who finished the night 3 for 5 scoring 3 times with 3 RBI’s, a double and a great game behind the plate calling balls and strikes. Wade Miley gets the win tonight and pretty much locks up the rookie of the year award for the season going 16-10 with a 3.25 ERA. The SanDiego Padres try to avoid a series sweep by the Diamondbacks after loosing game 1 3-2 and game 2 by a score of 6-2. The Dbacks would loose a close one by a score of 6-5 after a late surge will stall in the 9th. 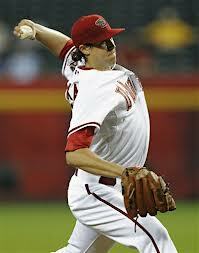 Rookie Pitcher Tyler Skaggs the youngest starting pitcher in MLB takes the mound today. The Rookie Tyler Skaggs would toe the rubber for the Dbacks in his 5th start and would exit early in the 5th after giving up 4 runs on 7 hits. The Dbacks would a lot of production out of right fielder Justin Upton going 3 for 4 scoring 2 runs as Chris Johnson goes 3 for 4 with 2 RBI’s on the night. The Padres would jump out to an early lead after a walk by Chase Headley walks and Yasmani Grandal hit a single. with 2 on and 1 out Jesus Guzman hits a home run to left center for a 3-0 lead. Aaron Hill hits a home run. In the bottom of the first Aaron Hill would get the Dbacks on the board with a solo home run. Andy Parrino would lead off with a walk that would pay off for the Padres when 3 batters later Logan Forsythe hits a RBI double. the next few innings go by with no runs until the bottom of the 4th when the Dbacks lead off with a Double by Upton followed by a walk to Paul Goldschmidt. Chris Johnson would hit a single to left field that would score Upton to make it a 4-2 game. After a pitching change by the Dbacks to Brad Bergesen would give up a lead off single to Parrino and Chris Denorfia would hit a RBI double. Chase Headley would Double 2 batters later to score Denorfia to make it a 6-2 ball game. In the bottom of the 6th Upton would hit a triple to deep center and Goldschmidt would hit a RBI single to go 6-3. Two batters later Chris Johnsonhits a RBI single to get the score 4-6. Eaton hits his first homerun ball. In the 7th the Spark Plug Adam Eaton would hit a ball to right field that would carry over the right field fence for a Solo Home run for his first ever MLB home run and his 8th on the season including AAA. SEE VIDEO HERE:http://mlb.mlb.com/media/video.jsp?content_id=24933715 The Dbacks loose the game 6-5 as Tyler Skaggs gets the Loss and Clayton Richardgets the win improving to 14-12 on the season. Game Ball goes to Justin Upton and Chris Johnson going 3 for 4. My Game ball gets cut in half tonight as Justin Upton and Chris Johnson both go 3 for 4 on the night and both deserve the game ball. Tomorrow the Dbacks head to Colorado to face a rockies team hampered by injuries and a roster full of newcomers. AND THEN THERE WAS ONE………..
Today we switch it up and throw the AAA up top as what they did today is something that may only happen to a team once if ever. 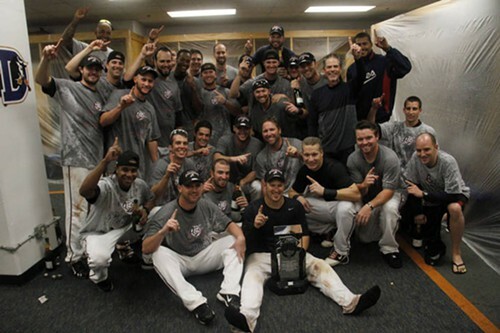 The Reno Aces not only won their PCL Division Tittle this season but they also won their first ever conference Title, A Pacific Coast League Title and They also won the AAA National Championship Title By beating the Pawtucket Paw Socks 10-3 Tuesday night. The Aces win the National Championship by sending Trevor Bauer The #1 pitching prospect in the Nation and the 3rd overall pick of the draft to the mound at 21 years old. On the other end of the spectrum the Paw Socks send their Ace a 38 year old Nelson Figueroa who wants to end his career on a high note with a National Title. Theres one problem with that equation…. Figueroa never had to face a star studded line up like the Reno Aces and at 38 years old this may not have been the time to test himself. Trevor Bauer would make quick work of the 1st inning by recording 2 ground outs and a strike out to end the first. 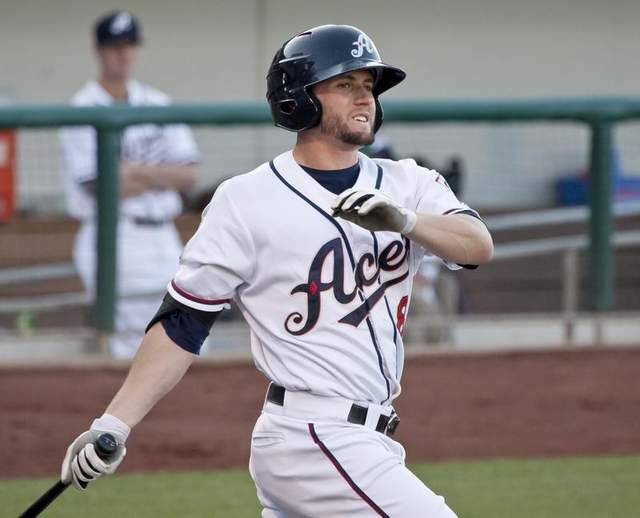 The Aces would jump all over Figueroa in the first inning when PCL champion MVP AJ Pollock stepped in the box as the first batter and took the 2nd pitch deep to center for a triple. Tyler Kuhn would get a RBI single to score Pollock and Josh Bell and Mike Jacobs strike out. With 2 outs Brent Clevlen steps up to the plate and absolutly smashes a ball over the center field fence for a 2 run home run and a 3-0 lead. In the 2nd for the Paw Socks Danny Valencia would hit a lead off double but would be stranded on base after Bauer would get a strike out and two pop ups to end the 2nd for Pawtucket. 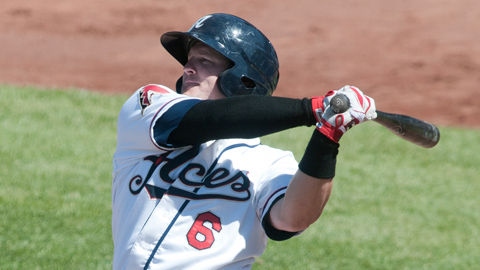 The Reno Aces were not done swinging the bats just yet as Tyler Bortnick would single, Ryan Budde would line out to center for out #1. AJ Pollock would hit a RBI double to CF scoring Bortnick, Tyler Kuhn singles to score Pollock and Josh Bell singles to score Kuhn and make it a 6-0 game. Bauer would have some trouble in the 3rd with his command walking 2 men but gets out of it by striking out 2 and getting a ground ball to keep the game scoreless. Brett Butler keeps the foot on the throttle in the 3rd and scores 2 more runs on a single by Brent Clevlen, a Taylor Harbin walk, Ryan Budde RBI Sac fly, Keon Broxton singles to 2nd to end the 3rd. In the top of the 4th the Paw Socks would get on the board with a Danny Valencia walk, Dan Butler single, Jonathan Hee walk, and a 3rd walk of the inning by Bauer walking Che Hsuan Lin would push across Valencia. in the 4th Reno would go quietly for the first time to keep the score 8-1. The Paw Socks would snag another run in the 5th when Tony Thomas uncorks on a fast ball and hits a solo home run making it 8-2. Before the top of the 5th was over Trevor Bauer would be relieved of his duties after walking the bases loaded and Mike Demark would get the 3rd out on 2 pitches. Trevor Bauer would get a no decision on the night and go 4.1 innings allowing 2 runs on 4 hits with 7 walks and 6 K’s. In the bottom of the 5th the Aces would get that run back on a Tyler Bortnick hits a lead off double and Keon Broxton hit a 2 run Home run to tack on 2 more runs making it a 10-2 game. With exception to the 1 run in the 7th by Pawtucket the rest of the night would be handed to the bullpen as the reno aces send Sam Demel in for a 1 run inning. Jensen Lewis has been Reno’s set up man all year and has really been lights out for the Aces all year having a perfect 8th inning to cap off his season before handing the ball over to the closer Big Jonathan Albaladejo who came in and blew the ball right past everyone. 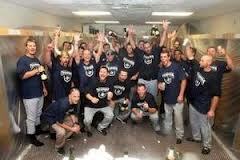 The Aces cap an amazing season with an amazing performance to prove that in fact they are the best team in AAA baseball this year as they blow through the competition and win their first AAA National Championship. Congrats to the Aces ball club on a spectacular performance and making it fun to cover you all year. The sacrifices these guys make day in and day out to play the game we all love so much often goes un-noticed and on behalf of the Fans and Behindhomeplatebaseball.com we Thank You for all your time and efforts. Good luck to those who get called up and we will see you in the spring, only 196 days till we return let the countdown begin. AJ Pollock would be selected as the National Championships MVP going 2 for 5 scoring twice with a double, a triple and1 RBI.Pollock was also selected as the leagues PCL Championship MVP. Honorable mention goes to Tyler Bortnick 3 for 4 with 2 doubles and 2 runs scored. 6 players had 2 hits or more: Pollock, Kuhn, Bell, Clevlen, Bortnick, and Broxton. 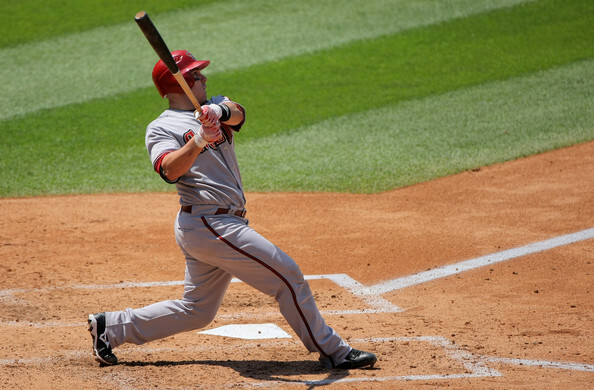 CALL UPS: AJ Pollock and Mike Jacobs were called up today to the Dbacks and both are class acts that should add some depth to the bench for pinch hitting for the rest of the year. The Dbacks place themselves in the wild card race with their last 2 wins and look to keep the winning streak going and end this season on a high note. With 17 games left in the season and the way this division is shaping up they may need to win at least 10 of those games and may need some help from others to get in. To do that they would send their young 27 Year old Ace IPK Ian Kennedy to the mound to square off against 33 year old Eric Stults. The fans were excited to see Chris Youngs return to the line up after his recent injury but it would be short lived when the first pitch was hit deep to center he tracked the ball to the warning track and made the catch but came up limping. You could read his lips as he looked to the dugout and said “im done” giving the signal to Gibby. after the game he said ” i felt good before the game and i put in a lot of work but as soon as i got it, it grabbed on me”. Chris Young likely wont return this season and comes out of the game and Adam Eaton takes over center field as Gerardo Parra takes Left Field. Kennedy would struggle in the first giving up a single, a walk and a single to get to Yonder Alonso who would hit a sac fly to score Logan Forsythe to make it a 1-0 ball game in 1st. Starting it off for the Dbacks would be the spark plug known as Adam Spanky Eaton who would draw a 9 pitch walk, Eaton would steal his 2nd base swiping 2nd. The stolen base by Eaton would prove to be huge for the Dbacks as Paul Goldschmidt singles to right field Eaton easily trots in. 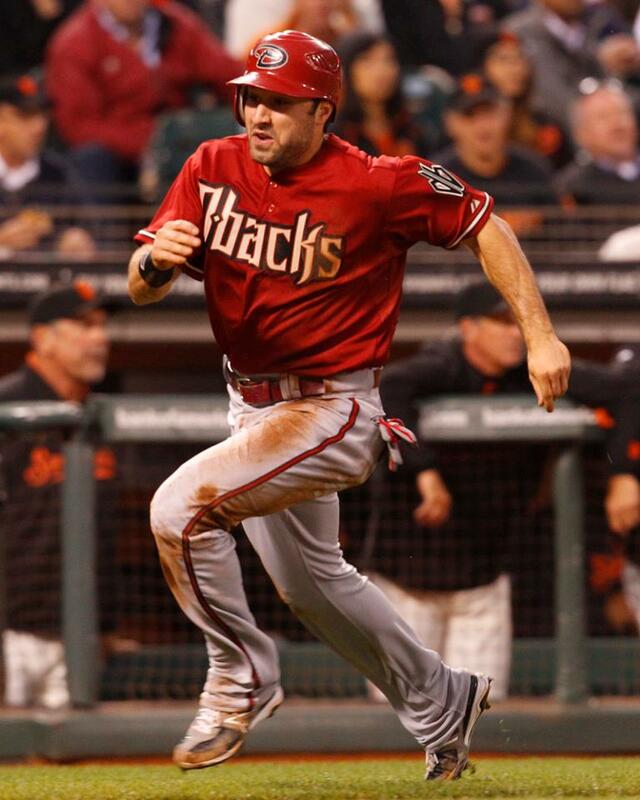 Miguel Montero would double to score Goldschmidt and the Dbacks now lead 2-1. the game would be relativley quiet for a few innings until the 5th when Justin Upton walks and Montero hits a double to score Upton 3-1 Dbacks. a few more scoreless innings and Kennedy goes 8 innings of outstanding pitching giving up 1 run on 7 hits with 6 K’s, before handing the ball over to J.J Putz to get the save to win the game 3-2. Game Ball to IPK 8 innings 1 run. GAME BALL: My game ball has to go to IPK for pitching one hell of a game with some of his best pitching in the 8th striking out 2 men. Honorable mention: Montero goes 2 for 4 with 2 RBI’s and Adam Eaton doing what a lead off guy is supposed to do with 2 walks and a stolen base scoring a run. Today the Diamondbacks return home to Chase Field to face a LA Dodger team that has been under performing for their expectations after adding $170+ million dollars in salary to their roster. 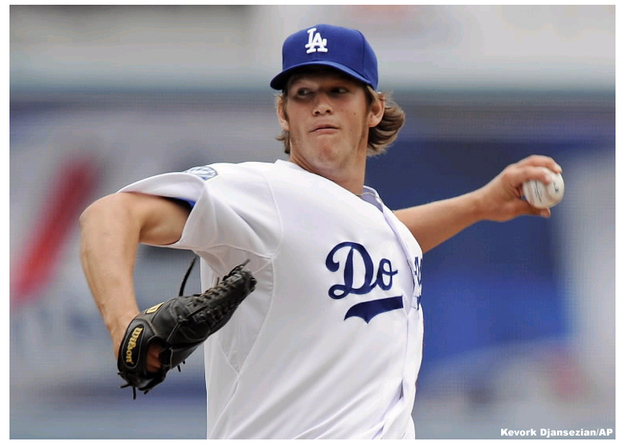 Today the Dodgers would start Reigning CY Young winner Clayton Kershaw 12-8 against the Dbacks Ian P Kennedy12-11. Both pitchers would pitch one of their best games on the season. Kershaw would go 7 innings giving up 1 run on 3 hits and 5 strikeouts. IPKwould have an even better night going 7 1/3 innings allowing 4 hits and 0 runs with 6 strike outs. IPK would get the win tonight when the only run the Dbacks would score would come off of a error from Hanley Ramirez when he threw the ball away on a Paul Goldschmidt infield hit. 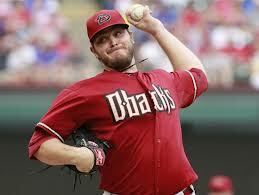 So the story tonight was Pitching, Pitching, & more Pitching as the Dbacks win game one of the 2 game series 1-0. With JJ Putz out with lower back tightness the save would go to David Hernandez his 15th of the year. The Reno Aces would open game one of the PCL Championship series with the most dominating playoff offensive performance in club history. 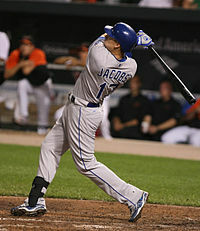 The Aces would blow the Storm Chasers out of the ball park by winning this game 13-1. #1 pitching prospect Trevor Bauerwould start the night a little slow giving up a run in the 2nd and walking 5 guys by the 2nd inning but pitches out of a bases loaded jam in the 2nd. Bauer would last 6 2/3 innings giving up 3 hits and 1 run to earn the win and improve to 2-0 in the post season. For Omaha their top prospect Wil Myers was held hitless in this game where his team needed him one of the most. The Aces had 5 home runs on the night as Ryan Budde hits 2 HR with 3 RBI’s. Mike Jacobs, Ryan Strieby, and Tyler Kuhn all hit home runs on the night. Every hitter in the Aces line up record at least one hit in tonights game as the Aces collect 15 hits on the night. The Storm Chasers Top Ace pitcher Jake Odorizzi looses the game giving up 9 runs on 9 hits. The Aces continue to find ways to win ball games without some of their top prospects. The Baybears loose the first game of the AA championships to the Generals 8-1 in a game they were held scoreless for 8 innings tonight as James Paxton gets his 2nd win of the post season lasting 7 1/3 innings giving up 4 hits and 1 run. Chase Anderson goes 5 1/3 innings giving up 4 runs on 5 hits and the loss. The star of this game has to be Generals Johermyn Chavez who goes 2 for 4 on the night scoring once and had 1 home run and 5 RBI’s on the night. The Dbacks Rookie Affiliate Missoula Osprey send pitcher Chris Thomas to the mound to square off with Ogden’s Miguel Sulbaran and for the first 2 innings it would be a pitchers duel. Sulbaranwould get yanked early after giving up 3 doubles in the 3rd and a double and a home run in the 4th to loose the game 4-3. Offensivly the player of the game goes to Pedro Ruiz of the Osprey who went 2 for 4 scoring once with a double and 1 RBI on the night. The Osprey win the game in front of 1308 fans at home. a late push by Ogden would stall in the 7th as they go hitless in the final 2 innings. gave up a grand slam and a solo home run to put the game out of reach for the Dbacks. At 42 years old and very troubling numbers from Siato i don’t know why the Dbacks don’t cut him and go to some of the young gunners they have like Jensen Lewis of AAA Reno or bring back Sam Demel who both have been very consistent this year. The game wouldn’t really start until the 2nd inning as both starting pitchers work quickly through the 1st inning. in the 2nd the Dbacks Patrick Corbin would give up a lead off double, a walk, and another double to Cameron Maybin who would record the first run for the Dbacks. Andy Parrino would hit a sacrifice fly to get a RBI in and score Jesus Guzman and break out to an early 2 -0 lead. In the 3rd the SPARK PLUG known as Adam Eatonwould lead off with a double to left field. With the open base the Padres walk Aaron Hill and decide to pitch to Jason Kubel. The walk would backfire when Eaton and Hill would pull off the double steel marking Eaton’s first stolen base. Jason Kubel would hit a ground ball to first and on contact Eaton breaks for home plate to score. It wouldn’t be until the 5th that we would see another hit in this game as Corbin and Andew Werner settle in. Chris Denorfia would lead off the 6th with a home run to left field to make it a 3 run ballgame. After Corbin gave up a single to Logan Forsythe and a walk to Carlos Quintin the Dbacks would relieve Corbin of his duties on the mound going 5 1/3 with 3 runs on 6 hits. Mike Zagurskii would give up a walk in the 7th to John Baker before handing the ball over to 42 year old Takashi Saito. Siato would give up a Walk to Forsythe and then Back to Back home runs. Chase Headley’s home run was a grand slam and Carlos Quintin a solo shot. In the 8th Adam Eaton would collect his second hit of the night on a ball that rolled just 5′ in front of home plate but with his Redonkulous speed would get his 5th infield single and his 10th hit in only his 5th game in the big leagues. Adam Eaton would raise his AVG to .400 on the day going 2 for 4 with a run and a walk in this game. Eaton would not only show case his wheels on the base path but on defense as well. John Baker would hit a ball way over Eaton’s head to the warning track but with his speed i don’t think anything is officially over his head unless its a home run because Eaton tracks this ball down and catches it 2′ from the warning track. If making the best catch in the game wasn’t enough Adam Eaton would showcase the 4th dimension to his game when he spins and throws an absolute strike from 200+ feet away to first baseman Paul Goldschmidt to double up Andy Parrino. Adam Eaton recalls the play after the game saying “The ball was a pretty good shot out there to left center and i happened to come down with it, i saw that Parrino was decently far off, usually a few steps to second is kind of a gauge and i happened to make a good throw, Goldschmidt made a good snag over there and it happened to work out”. Now i saw this play live and Eaton is being a little modest and humble in his choice of words , it wasn’t a “good throw” as he says or a “good snag” it happened to be a perfect throw and an effortless catch to Goldy….. With this play Adam Eaton would not only earn the #1 WEB GEM on ESPN that night but would earn player of the week from the Diamondbacks and solidify a starting position in next years starting outfield. 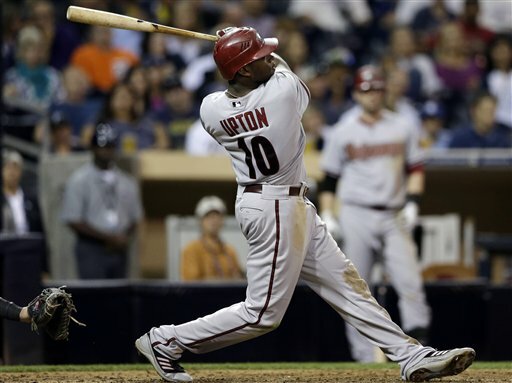 Trade rumors already begin to stir on a trade of Chris Young or Justin Upton all around Major League Baseball as the Dbacks could add Eaton to the roster and possibly get another good pitcher for the money they owe Upton/Young. The whole season comes down to one game for both these teams, the winner advances to the Pacific Coast League Championship and will come down to RHP Brett Tomko for the Aces and Sonny Gray for the Rivercats. Brett Tomko would start off a little slow when he would give up 2 runs on a walk and two hits in the first inning. Kila Ka’aihue would hit a double to center scoring Jermaine Mitchell and Michael Taylor would single on a line drive to right field that would score Ka’aihue. the next 3 innings would be lights out pitching for both pitchers each giving up a few hits over 3 innings but 0 runs would score. At the beginning of the 5th inning the Rivercats would score another insurances run on the Aces when Josh Horton would single, Jermaine Mitchell would ground out but move Mitchell over. Grant Green would come up with a clutch hit to center field that would score Josh Horton making it 3-0. In the bottom of the 5th inning Brett Butler would light a fire in this order when Taylor Harbin AKA Mighty Mouse hits a deep fly ball to left field back, back way back GONE! HR (5) the little guy 5′ 9″ 171 LBS goes yard proving #LittleGuysHitBombsToo. Things would become troublesome for Sacramento with the walk Tyler Bortnick, Ryan Budde singled to right field. Wladimir Sutil with 2 on gets on base. AJ Pollock fly out, Tyler Kuhn And Josh Bell both hit a single and score. The game would remain a 3-3 game with great defense all game Merkin Valdez would replace Sonny on the mound. His first pitch was drilled to center field by AJ Pollock, Tyler Kuhn a Sacrifice out. Josh Bellwould be intentionally walked. Mike Jacobs digs into the batters box and hits a monster 3 run home run to tie the ball game at 3 a piece. 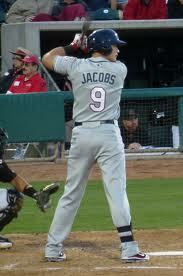 The Aces get 4 more runs on another Mike Jacobs home run which would seal the fate of the rivercats. Taylor Harbin finishes the night 3 for 4 with a HR. 4 other players collect 2 hits a piece. Reno had 12 hits and 7 runs. Zach Kroenke gets the Win for the Aces and Merkin Valdez gets the loss. The PCL Champions Reno Aces will face the Omaha Storm Chasers to a best of 5 games to win the Pacific Coast League Championship. 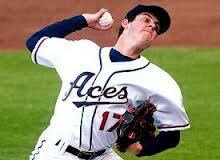 The Aces will throw pitching phenom Trevor Bauer. Another Dbacks team has a chance to play for a championship when the Baybears take on the Biscuits. The Baybears work hard to get 1 in the 1st inning on a double from Chris Owings and a sac from Mat Davidson. Montgomery would add 3 in the second inning on 2 singles and a triple. the rest of the game would be dominated by the Baybears as they score 2 in the 4th, 3 in the 5th 1 in the 6th, 3 in the 7th and one more in the 8th to beat the Biscuits 11-4. 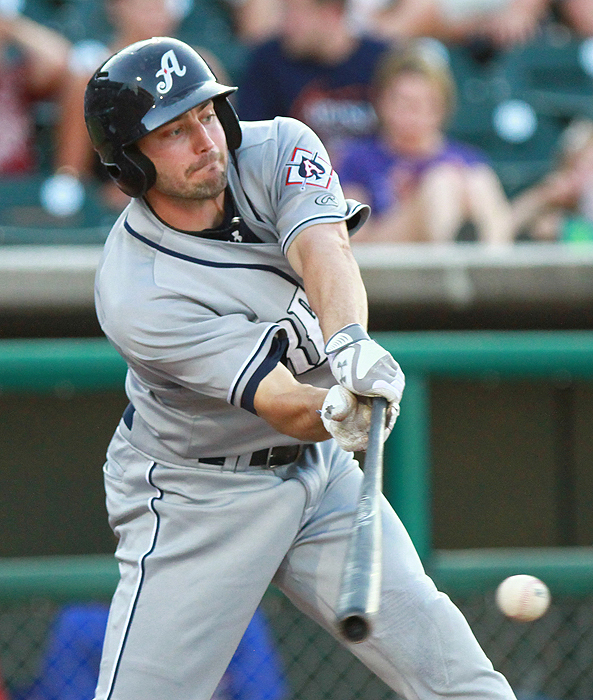 Leading the way for the Baybears is top prospect Chris Owings who went 3 for 4 with 2 runs scored and 2 doubles. Jonathan Griffin and Yazy Arbelo also add a home run a piece with 2 RBI’s each. Michael Bolsinger would get the win for the Baybears lasting 5 2/3 innings giving up 4 runs on 5 hits. Merrill Kelly would get the loss for the biscuits and their chance at a 2012 Southern League Championship is squandered as the Baybears come into there house and take it from them. The Baybears will face Jackson Generals for the Championship. The game would get to a low start as the teams are scoreless in the first 3 innings. in the 4th Missoula would score 2 runs on 2 singles and a double to take the lead. Great Falls would answer that with 1 run in the 4th a double and 2 errors. Missoula would erase the error in the 5th on a lead off triple from Andrew Valasquez and a single from Daniel Pulfer. The pitching staff from Missoula would hold off Great falls as Starter Yoimer Camacho goes 5 innings giving up 2 hits and 1 run and win the game 4-2. Daniel Pulfer would go 4 for 5 with a triple and a RBI to win the game for the Osprey who advance to the 2012 Pioneer Baseball League Championship to face the Ogden Raptors. CHAMPIONSHIP BOUND, the Reno Aces, Mobile Baybears and the Missoula Osprey all advance to their respective championship series to mark 3 different Diamondbacks Affiliates to play for a title.